26 Jun 2018 --- Vegan products have become more mainstream and we now see a much higher prevalence of food companies moving straight beyond vegetarian to vegan. The plant-based food market is growing at double-digit rates and expected to reach US$5.2 billion worldwide by 2020, according to Nestlé and a significant proportion of this will be down to plant-based snacks. The trend in plant-based foods is not slowing down either. A CAGR in products featuring the plant-based claims such as “plant-based” and “100 percent plant,” has been +60 percent from 2012-2016. The “mindful consumer” was listed as Innova Market Insight’s top trend for this year, which certainly crosses over into the snacking category. Consumers are more conscious than ever about making responsible food choices that are not only healthy, but that also take sustainability and ethical considerations into account. According to data from Innova Market Insights, there has been a 45 percent average annual growth of food & beverage launches with a vegan positioning (CAGR, 2013-2017). New launches with a vegan positioning increased its market penetration in Europe from 1.5 percent in 2013, to 7 percent in 2017. There has also been a 55 percent average annual growth for new food & beverage launches tracked with vegan positioning in Europe (CAGR, 2013-2017). In 2017, 12 percent of all new F&B launches tracked with vegan positioning are snacks. Mini meal components that serve as a snack have strong staying power, with fruit and vegetable snacking options on the rise. CAGR in new fruit & vegetable products with a “snack” claim has risen by 25 percent from 2012 to 2016, including the fruit-based snacks subcategory and the fruits & vegetables category as a whole. Between 2013 and 2017, the number of ready meals launches tracked with vegan positioning globally show an average annual growth rate of 58 percent (CAGR, 2013-2017). More and more meat producers are adding plant-based products to their portfolios. The burger product category is very trendy right now, and there is a lot of movement internationally with some spectacular announcements of product innovations. 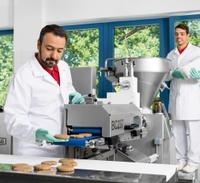 Stabilizing and texturing specialist Hydrosol is showing that its new stabilizing systems makes possible the simple, safe production of burger patties and many other products on existing production lines. Vegan burger patties are based on texturates that give the final product a hamburger-like texture. HydroTOP High Gel 30 provides these texturates with the necessary binding. “The system is based on a tailored hydrocolloid fiber combination of emulsifying and stabilizing components,” explains Dr. Carsten Carstens, Innovation & Product Manager for meat products at Hydrosol. “First an emulsion is made with HydroTOP High Gel 30, oil and water, which stabilizes the texturate. This gives a compact, formable mass comparable to bound ground meat. This meat substitute mass can be seasoned to taste and produced on conventional machines like cutters or mixers, and then shaped as desired in conventional molding machines,” he notes. HydroTOP High Gel 30 is suitable for binding all normal texturates on the market, according to the company. In addition, Hydrosol offers all-in compounds for the simple production of ground meat substitutes. Investments in complex extrusion technology, which can quickly run into the seven figures, are not necessary. Hydrosol’s all-in compounds contain all the ingredients needed for making vegan burger substitutes – texturate and binder plus flavoring, seasoning and color. The final products feature classic meat flavor and product-specific aroma. The product portfolio includes soy-wheat as well as soy-free texturates. 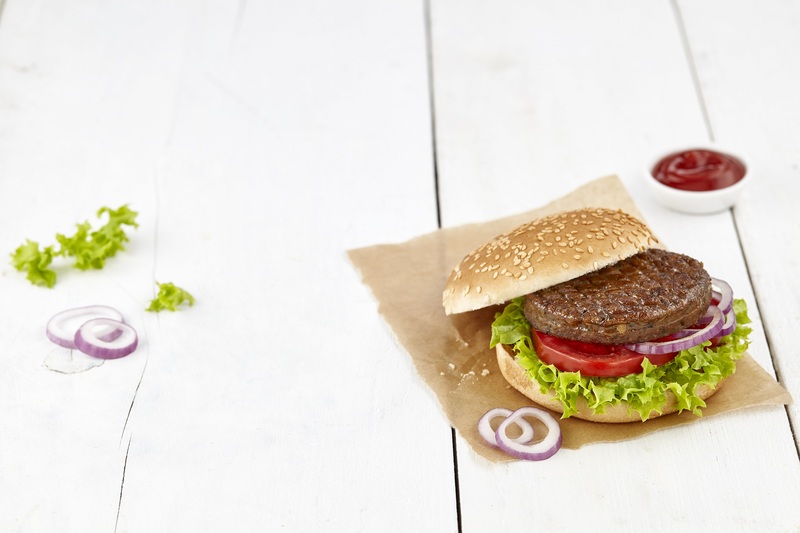 “The development of these new vegan burger patties took about two months, but we have been working on various vegan alternatives for the past few years which makes us an expert in protein,” Bark reveals. “With the stabilizing system HydroTOP High Gel 30, a wide range of products are possible to produce. For example, Vegan Nuggets, Chicken Nuggets, and Vegan Filet strips can also be produced, using this technology,” she states. These all-in compounds can be used to make a wide range of meatless products, from burger patties, meatballs, köfte and cevapcici substitutes to vegan shish kebab. Meatless nuggets, schnitzel, filet strips and fish sticks and other breaded products are also possible. The ground product mass is freeze-thaw-stable and can also be used in ready meals. “The final products can be pre-cooked so that before eating they only need to be heated up in the oven,” explains Dr. Carstens. “If the burger patties are frozen raw they can go directly into the frying pan. That’s a big advantage, especially for short-order restaurants. The vegan köfte and meatball alternatives are also sterilization-stable so that they can be canned as ready meals without problems,” he adds. “More and more of our customers and consumers are asking for vegan solutions – especially for soy-free alternatives. Currently, a lot of the products in the market are based on soy proteins,” Bark explains. 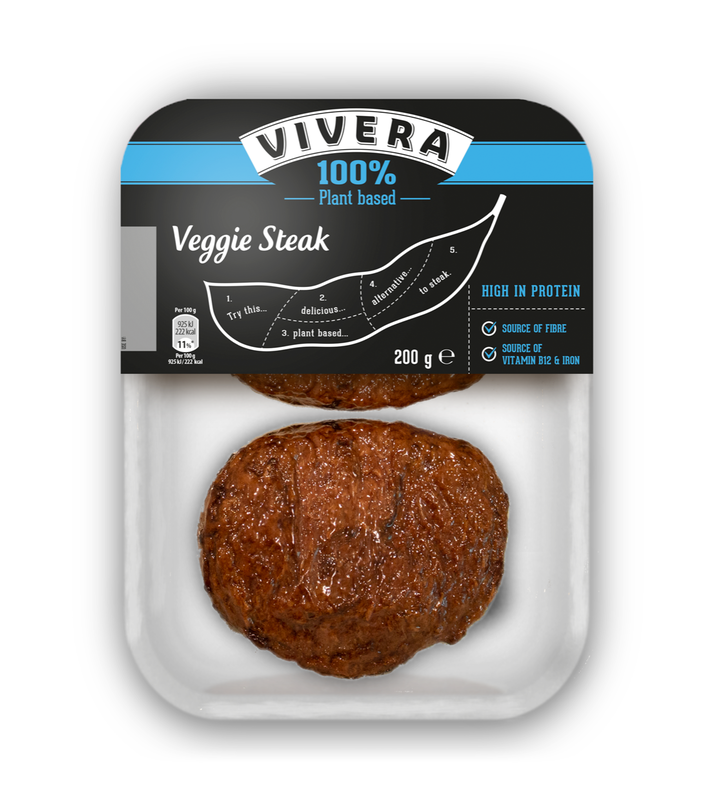 Back in May, Dutch manufacturer Vivera announced that, as the first company in the world, it was set to bring 100 percent plant-based steaks to the European market. British supermarket chain Tesco became the first to sell the ground-breaking product as of 21 May 2018, and the steak was stocked in more than 400 supermarkets in the UK. As of June 2018, several supermarket chains followed suit, in the Netherlands and from the second half of 2018 Vivera will sell the product in other countries in Europe, starting with the German, French and Italian markets. Just a few weeks later, UK retailer Sainsbury's announced that it would trial the stocking of alternative meat products in its meat aisles this summer, as opposed to in their own dedicated sections. As of June 27, Sainsbury's customers will be able to find vegan and vegetarian plant-based products from Naturli’ Foods in the meat aisles at 400 of its stores in the UK. The Naturli’ Foods’ burgers and mince are made from almonds, tomatoes, and porcini mushrooms. According to the company, the Naturli’ products are not designed to taste like beef but have an underlying “meatiness” thanks to the umami flavor. Similar to the Beyond and Impossible Burgers, Naturli’s burger “bleeds” with the help of beets, which give the burger a reddish color. Plant-based based protein is continuing to turn heads, specifically in the vegan space. Protein remains an essential nutrient overall and with the demand for vegan options on the rise, the need for alternative protein is accelerating. Vegan innovation for NPD seems to be making its mark across several segments, including snacking and dairy alternatives, which also takes several factors around health, animal welfare and sustainability into account. As more and more consumers move to a vegetarian and vegan lifestyle, this could become a standard tradition. But one thing is clear, if more options are available and appeal to a broader audience, more opportunities will be created for manufacturers and consumers alike.